Congratulations to our New York York Medical Malpractice Attorney Marijo Adimey who was selected by Super Lawyer as a Top Women Attorney for the category “Personal Injury/Medical Malpractice, Plaintiff, 2016”. Top Women attorneys selected by Super Lawyer have been selected through an extremely rigorous process. After being nominated by their peers, candidates are then scrutinized by independant researchers before to be selected by a panel of highly credentialed lawyers. Only 5% of all lawyers nominated make it to the Super Lawyer List. 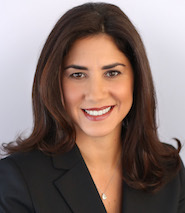 Recognized by SuperLawyer as a Rising Stars in 2013, Marijo Adimey joined our firm in 2014. Her trial advocacy and litigation skills have resulted in numerous settlements and verdicts on behalf of her clients. Ms. Adimey performs all aspects of the litigation of medical malpractice and personal injury cases in New York and New Jersey from inception through, and including, trial. Her combination of hard work, dedication, conviction and attention to detail is reflected in everything she does and was recognized in January 2017 when she became a partner at the firm. Her passion and commitment to her clients is what makes her a zealous trial attorney. She is a tremendous asset to the GGCRBHS&M team.